The weave along ended with some prizes. One of the prizes is a Sweetheart Loom from Hazel Rose Looms. Marsha made good progress on her Little Wave cardigan by Gudrun Johnston. 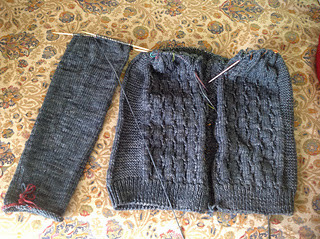 She has knit the body up to the armholes and has finished the first sleeve. When the second sleeve is completed both will be attached to the body and the yoke and saddle shoulders worked. This is the first sweater Marsha has made with this technique. Marsha cast on for the Summer Fjord by Trin-Annelie. This is the same Tee Kelly is making and like Kelly, Masha is using a different weight of yarn. She is going up to DK with Fibra Natura Flax (100% linen) and Kelly is going down with lace weight Sincere Sheep Linen. Lots of swatching, washing, measuring, and math when into the decision of sizes to make. There was pronounced biasing on Marsha's swatch so the Summer Fjord seemed a good choice with the different stitch patterns breaking up the stockinette. Kelly's Summer Fjord has the body finished and is waiting for some work on the neckline and sleeve caps to be finished. Kelly has been a little slow on her projects, although she did finish the Christmas dishtowels that she recently put on the LeClerc floor loom. The towels are all variations of Swiss Twill from the Marguerite P. Davison weaving book. Kelly has also cast on the Sommer tank by Mari Chiba. The yarn is some of her oldest stash, purchased in 2007 for a tank top shown in a magazine in May of that year. That sweater never got made and the yarn has narrowly escaped destash for a few years. She is "test knitting" this for a friend who might also want to make it. 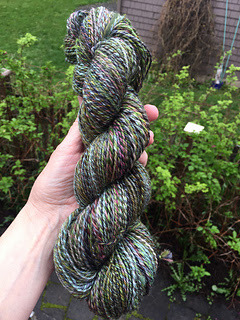 Marsha's has completed three skeins of her Combo Spin #3. Kelly and Marsha have a discussion on the math required to determine the final percentages of fiber in the finished yarn from the various fibers that were used. Marsha was unusually restrained in the destash room at the NoCKRs retreat in April with the exception of a large "friend" that drove home with Marsha. Kelly and Marsha tell the story of "Blithe Spirit" and her impact. She was discovered taking a nap at the NoCKRs retreat. Marsha tells the story of a very strange coincidence. Her son's girlfriend needed a bookcase so Ben and her dad went to the ReStore to look for recycled materials to build a bookcase. They came back with a chest that unbelievably had belonged to Marsha's mother Podie! The chest had been left in the house by the previous owners and Podie had used it in her sewing room for notions for over 50 years. They added the bookcase to the top, painted it green, and added the bead board to the back. Marsha had given the chest to the Goodwill over a year ago and the universe sent it back for Ben's girlfriend! Black Sheep Gathering in Albany Oregon, June 29-July 1. Listener meet-up on Saturday, June 30.